This is one of the maps in the project called Odyssey that the 2015 class of level designer made together. Each of the 13 students created a map that was then put together to form a full campaign. My level is the 13th and last map of the campaign. From the very start I wanted to make a lonely mansion with a barn, but the gameplay turned out a little bit different from what I had in mind. My very first thoughts were that the player would slowly make their way inside and through the house but then have waves of combines coming from all round the house making it an action filled final holdout. It ended up a little more slow paced and focused on exploring and building suspension up until the last part. This is an early blockout i made of the level. I was to continue using snipers that were introduced and used in the two previous levels. I stepped it up and had two of them poking out of the top windows of the mansion. The player then really had to think and look for a suitable cover to sprint towards. The bridge over the river worked as a chokepoint so that the player would have to go towards the snipers and not be able to circle around for an easy entry. Though after the player got over the bridge there were several directions to take. This made it hard to create a polished experience since it was harder to predict player movement. 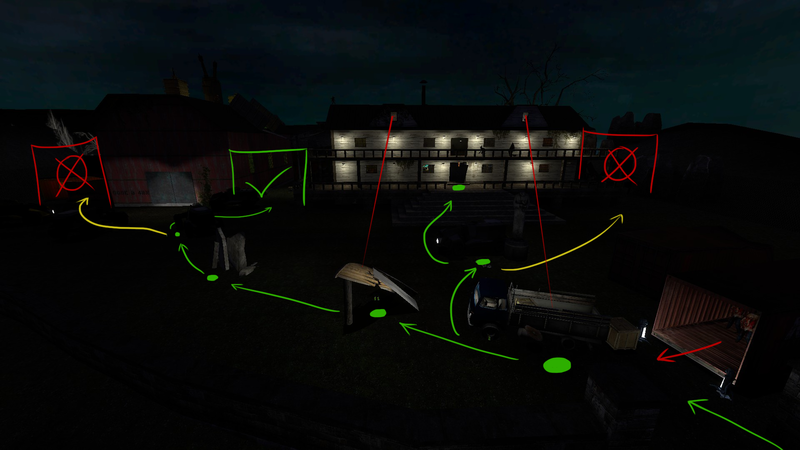 Therefore, I used cover placement and lighting to lead the player in between the two buildings. The very few players who strayed to the sides were soon met by props obviously blocking the way so that they would not waste time trying to get through. The players who chose the slightly more dangerous path straight towards the house are rewarded with a preview of what’s to come by looking through the first floor windows. 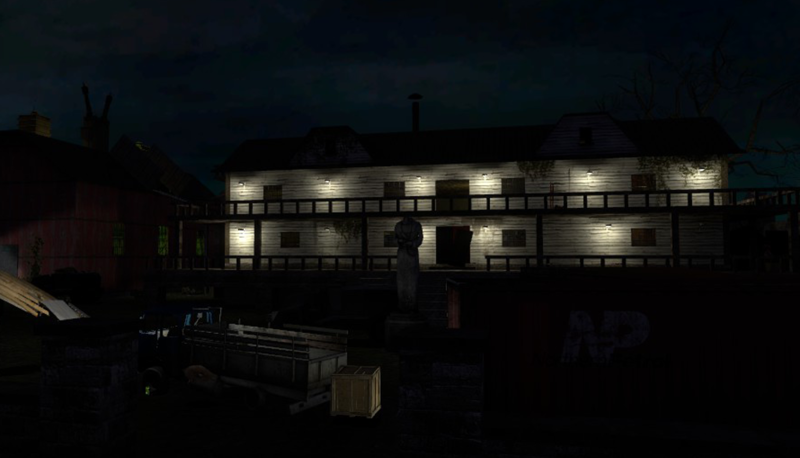 When coming in between the two buildings you will (if you haven’t already) see the green lights pulsating inside the barn. I wanted the player to wonder what was going on in there and let it be the goal of the level. Between the two buildings there’s an ammo crate next to a pole. 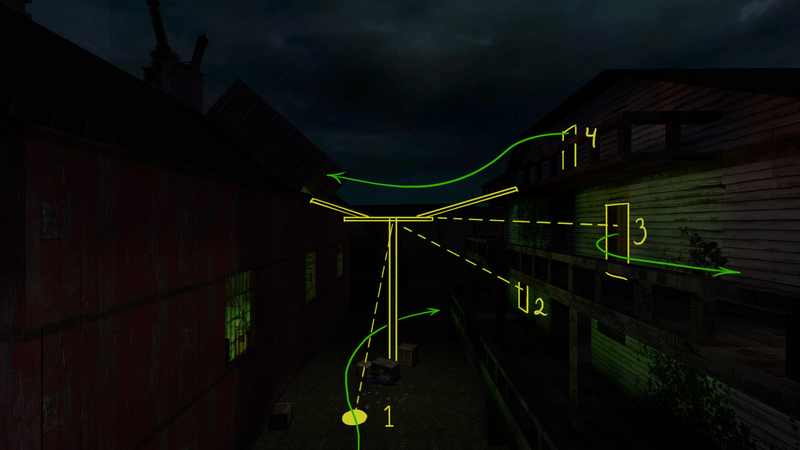 If the player looks(1) to see where the pole leads they’ll see the narrow walkway above leading into the attic of the barn. If the player missed it when passing through they’ll get another opportunity after entering the house and opening the shortcut (2). 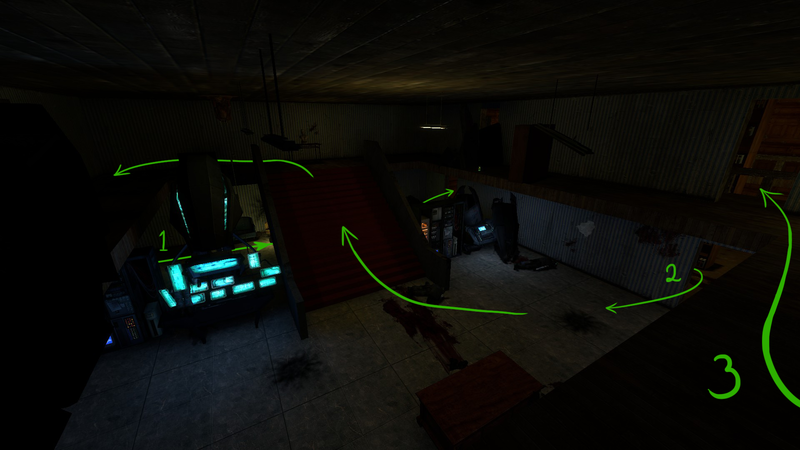 After the player has moved through the house and still missed the walkway or need a reminder they’ll face it when the route takes them out onto the balcony on the second floor (3). Finally when the player has made it from basement to attic they come out in front of the riggedy walkway and can cross over to the mysterious barn (4). The main hall was created to be recognizable to the player so that they would have a reference point. The path leads through this room three times. First you pass through the back (1) behind all the panels with the option for curious players to catch a glimpse of what’s happened on the other side. Shortly after that the player will enter from the side (2) and see the room as a whole, presumably noticing the large staircase and the broken front door on the opposite side. When entering the room for the third time the player will be coming from the balcony on the second floor (3). I felt that i wanted to use the space as much as i could, but By letting the player walk around the balcony I’m letting them create references with the outside environment to get a better grip of where they are. After the player has made their way through the attic of the barn they crawl through a ventilation shaft above the lab. They will not be noticed by the enemies until they break out of the shaft. There are two exits to choose from. 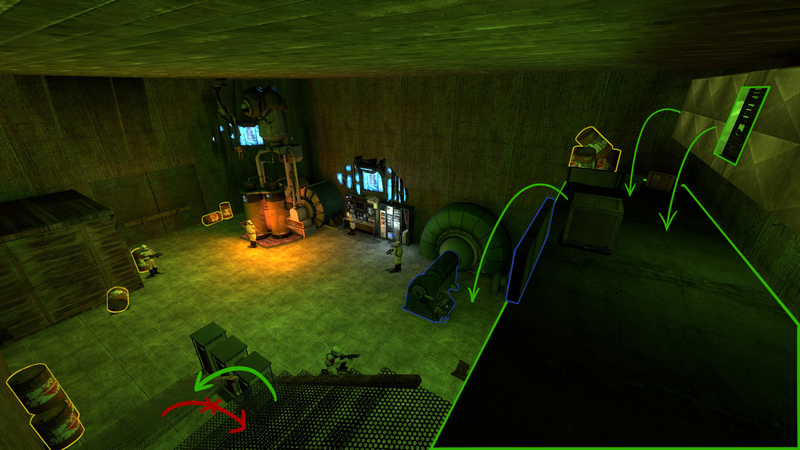 One overlooking the lab which gives the player a good look on the environment before engaging and another in the far end that is a little safer to crawl through but lands the player to the side of the cover and next to the explosives. I wanted to end the campaign by making the player feel powerful and let them overwhelm the enemy while also making it a bit challenging. Therefore I put quite a bunch of tough enemies there to make it threatening but also gave the player tools to be able to overpower them. You drop down on a high-ground giving you a great advantage. Together with the cover you are in a very defended position. Since the enemies cannot run up to you, grenades are the only thing that might force you out of cover. The stash of explosive barrels are great ammunition for your gravity gun, but must be used with caution. If the enemies are firing at you they might explode in your face before you get a chance to throw them. Though there are also explosive barrels placed around the lab which helps out alot. Even shooting just one can cause a chain reaction that can wipe out several enemies. By just giving the player these tools they are now feeling a lot more powerful than before. When the enemies all lay dead after the onslaught the player lowers their guard and walks down the stairs or jumps down. This is where – to the players surprise – one of the experiments(Antlion guard) break loose and charges them. The antlion guard is the challenging bit of the level which i added to make the ending rewarding also in terms of challenge. With Half-Life 2 as my reference I set out to use the tools and mechanics given to me without too much thought if all of them really were good. Ladders proved to be a problem maker. The ladders did not always work as the player though they would and sometimes they got stuck on them and they felt a bit wonky. 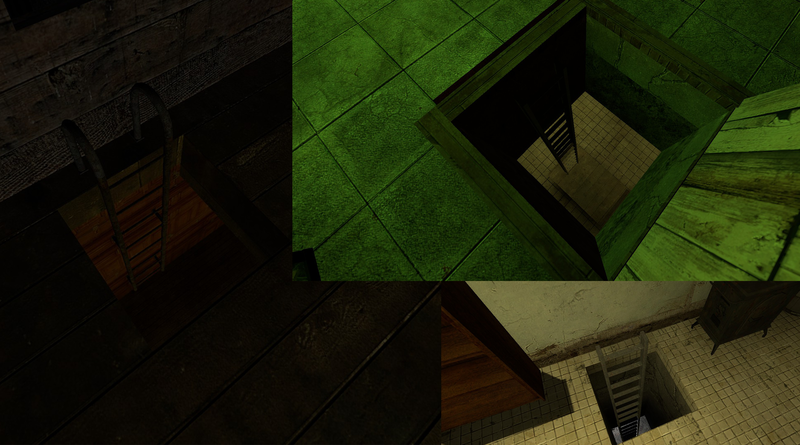 But despite these mechanical problems, ladders can often feel like cheap level design. When I then thought back on games i’ve played previously, I feel like they more often than not does not add anything to the game. I had not played Half-Life 2 before this project so I played it for the first time in research purpose. I saw what people had been talking about all this time. After playing through the whole game I was excited to use its assets and make an experience of my own design. The Hammer World Editor seemed tricky and outdated at first but I quickly got the hang of it and later grew very fond of it. It was also really fun working with the whole class to create a full campaign. We discussed the order in which our levels should come, what enemies and weapons each of us should introduce, made sure we had the right pacing and even set the time of day so that the day and night cycle would be believeable. Having free reins with a project can be really fun, but working within a frame and making use of what you are given is just as fun to me.